The Chairwoman of the National Assembly of the Socialist Republic of Vietnam emphasized that this is already the fifth meeting of the Speakers. ”This frequency indicates a high level of interaction between our countries,“ said Nguyễn Thị Kim Ngân. 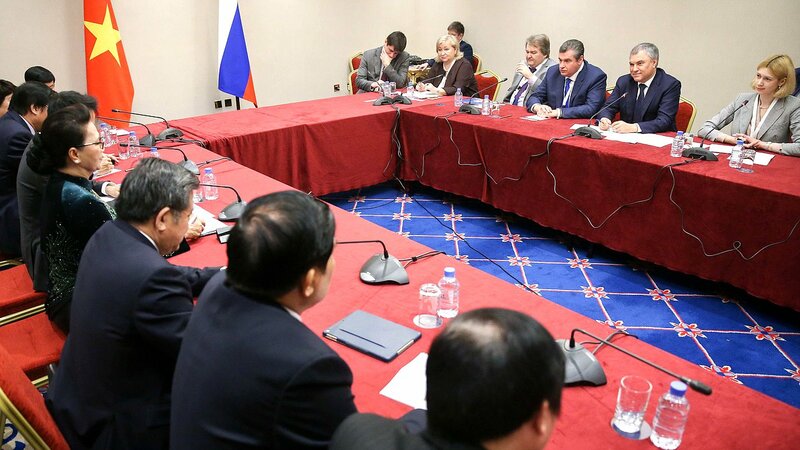 Viacheslav Volodin stressed that relations between parliaments are developing, and also invited the Chairwoman of the National Assembly of the Socialist Republic of Vietnam to Russia. “There are plans that you will visit one of the regions of the North,” he said. Thus, the Chairman of the State Duma proposed to hold a meeting of the high-level commission on interregional cooperation in the village of Sabetta, Yamal. According to Viacheslav Volodin, there is an enterprise that builds cooperation with Vietnam, Yamal LNG. “We need to do everything so that economic cooperation develops, trade turnover grows, these tasks have been set at the highest level,” said Viacheslav Volodin.